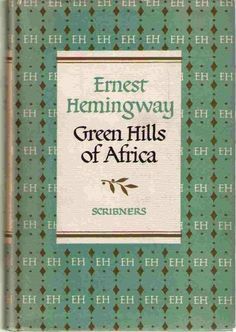 Hemingway wrote Green Hills of Africa as an experiment. The story of his 1933 hunt in Tanganyika is true, and he wondered if a true story, well-told, could compete with a work of fiction. His experiment was nearly successful. Green Hills is a bracing and sometimes beautiful book. It is as good as a novel, but not as good as a great novel. I read two different editions—the original Scribner’s and an excellent Scribner reprint which includes as appendices some wonderful Hemingway letters as well as the diary kept by his wife of the moment, Pauline. The diary confirms that Hemingway’s narrative followed faithfully the true course of events. Hemingway did change names—Pauline appears as “P.O.M.”, or “Poor Old Mama”—and he also omitted almost completely, much for the better, the first month of the expedition, which he spent deathly ill with a combination of dysentery and piles. Hemingway answers this question with total success in “The Short Happy Life of Francis Macomber,” a story that overpowered, at least temporarily, my own aversion to hunting. The feel of the country, the pursuit and the kill, its relation to courage and the concept of a man and manliness are exactly what Hemingway wanted to achieve in this longer, less fictional work. A little more fabrication in Green Hills might have put us closer to the truth—but it would also have robbed us of a remarkable achievement in a genre that defies traditional classification. Green Hills of Africa, by Ernest Hemingway. First ed, Scribner’s, 1935. This ed, Scriber 2015, 281 pages. Aerocity sunitaahuja Independent Aerocity Service 24/7 .